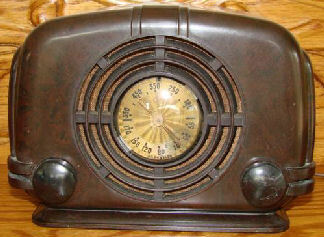 This is a 1940 Stewart Warner Dionne Quints radio. This radio case is broken and glued back together with no missing pieces. I can just picture what most likely happened. It was likely the radio was in a little girls room and a pillow fight took place. The radio fell form the night stand. Crying and crying took place and dad glued it back together. Also she must have scratched marks on the dial for her favorite stations, or dad could have because she was too young to get the hang of finding the stations. The paint is worn around the on/off volume control because her finger nails were to long. OK I'm making this up... but it could have happened. It gives it some personality. Or a reason for the marks and breaks. Ultradyne is stamped in the brass name tag. I have looked in every radio book and Riders and this radio is no where to be found. I was in an antique store in Missoula Mt and I asked the owner if he had any radios. He picked up this little radio from the floor behind the counter and said like this. I said "sure"! It was painted with a heavy coat black paint. Everything was painted name tag, knobs, dial, and grille cloth cloth. Well of course I bought it. I wasn't going to complain or haggle over the $10.00 he wanted for it. I was delighted to see the beautiful undamaged wood when I stripped the paint off. It too has a resistance line cord and plays very nice. This is a Detrola Super Pee Wee model 219. It has been painted black. Originally it was black plastic. Because the case was damaged and repaired, painting was the only option. It's marbleized beetle green and brown grille is in nice shape with just a very few hair line cracks. It has it's original back and resistance line cord. The resistance cord gets warm and the radio plays nicely. This is a Coronado Jewel model 43-8160. 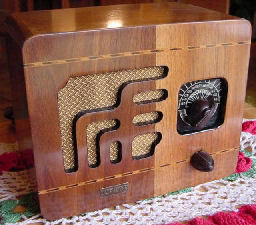 This 4 Tube radio was made in 1938. It was also produced under the Belmont name as well with a different model number.